“Iris” is stamped in a Spectrum Kaleidacolor stamp pad and stamped five times on white glossy card stock. 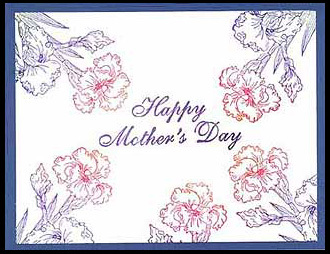 “Happy Mother’s Day” is stamped in lavender ink. The card is layered on blue card stock. Card by Margaret Wiggin. Previous post: Mother’s Day Card Using Rose Fan, Lg.